It’s our last day in Bogota so we make a token stab at the hotel breakfast (only my wife is actually eating it now as she likes the eggs and has worked out a formula for making the coffee drinkable; I just go down the street to Juan Valdez, and our son doesn’t even look at the breakfast – he knows there’s far tastier fare all around), and head out. We’re going to the Gold Museum which has a huge reputation. It’s a 10 minute walk from the hotel, and it’s housed in a beautiful building. Our guidebook calls it ‘perhaps the finest museum in South America’. The exhibit takes up three floors and is very impressive : shelves and shelves of golden artifacts, gorgeously presented and maintained. However, we’re with an eleven year old who is quickly bored so my mind turns to the question of how quickly can we get out of there. Traveling with kids is an incredible experience : it is so rewarding at times, but mostly it’s surprising. 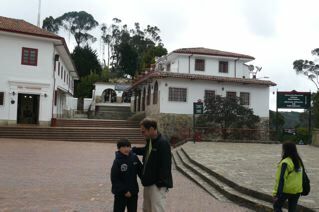 The surprise here is that I thought he would like it, when actually he wants nothing more than to explore the Bogota streets. I know him so well – or so I think – and spend the next hour or so hurrying us through the exhibits. We leave and find ourselves in a sidestreet of smallish stores all selling sportsware, mainly soccer gear. Now this is heaven for my soccer fanatic son, who makes a point of buying soccer jerseys all over the world and probably has over forty in his collection. He can’t get enough of this, and eventually settles on a Colombian national team shirt; immediately we’re converted into Colombian fans which isn’t easy as anyone we’ve met so far thinks they’re terrible, and their chances of qualifying for the 2010 World Cup – we’re going to that- are pretty small. Meanwhile, I decide to go into a travel agency to try confirm our flights to San Andres the following day. We had a nightmare set of experiences the previous year in Guatemala and Taca Airlines, so when I can’t find tomorrow’s reservation online, I get nervous. Traveling in a really foreign country where nobody seems to speak English is an exciting and a very real experience; you are thrown out of your comfort zone and made to adapt to the situation, but in this scenario, where i really need some information, it is not much fun. The people are very helpful and try their best, but when I emerge into the street, I’m still not sure about the flights, and can’t work out if going into the agency was of any benefit at all. Our son finishes shopping and we go for lunch. We find a place and decide on grilled chicken. Our waitress brings us curry instead. we send it back and she brings us the totally wrong dish a second time. We get a new waiter, who is wonderful, with good English, very chatty, helpful and professional. The first waitress unfortunately becomes a good travel story. We leave and set out for Monseratte. There is a long line of schoolkids out on a camp excursion and singing very loud kids’ songs. It may annoy some people but we like it, and in a vibrant, busy, noisy country, nobody seems to notice. 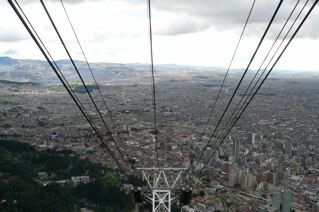 A steep cablecar takes us to the top from where there are great views of the city. Guidebooks have suggested not to go up at various times of day because of potential muggings; that’s hard to see right now with all the kids up on the top. 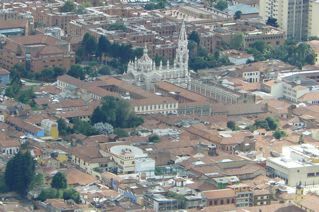 At the top is a church, and a small lane of souvenir shops, each selling the exact same thing. We go down and head back to the hotel. I go searching for a post office. With one of our kids at camp in Canada, the only way to correspond with him is by regular mail (our other child is in Israel on a program, but she has a phone, although we have not got hold of her yet). I walk for ages but with no success. we are only going to learn later that Colombia has a very unusual mail system in which the national airline Avianca, and some other private operation, run the show. 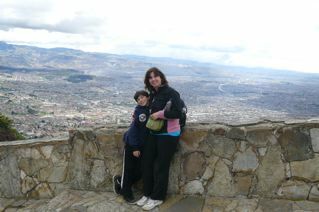 I give up, and we head out together into the Bogota streets one last time. We notice that the Botero Museum (Donacion Botero) is still open. I hadn’t bothered putting this on our agenda, as I know my son will find it deathly boring. I’m wrong, and we all love it. It’s full of very cool portraits, paintings and sculptures, again in a beautiful building and we wander around until they close. Bogota is really humming so we walk around just taking it all in. This is one of the delights of travel – the chance to meander about with no real plan, peoplewatching, trying out the shops, in this case munching on churros and other treats. There;s a drumming marathon going on – we’ve seen it the day before – and an open air book market, as well as vendors of every type all along the streets. Eventually things quieten down and we go to Pizza Polli – our son’s choice – for dinner. A really good day in a city we have loved.